When I first met Anna + Chris, I felt like we had known each other for years. I can easily see why their wedding was so much fun, and felt so customized to the pair. Little touches like golden dachshunds, flower crowns, happy bridesmaids and golden locks of hair abound. It truly felt like two families were coming together that day, and they were pumped about it! Dress: Wolsfelt's Bridal in Aurora, IL. The bride had an adorable grooms cake made from the college they attended together. The dessert table looked amazing with the tiered cake stands and boxes. 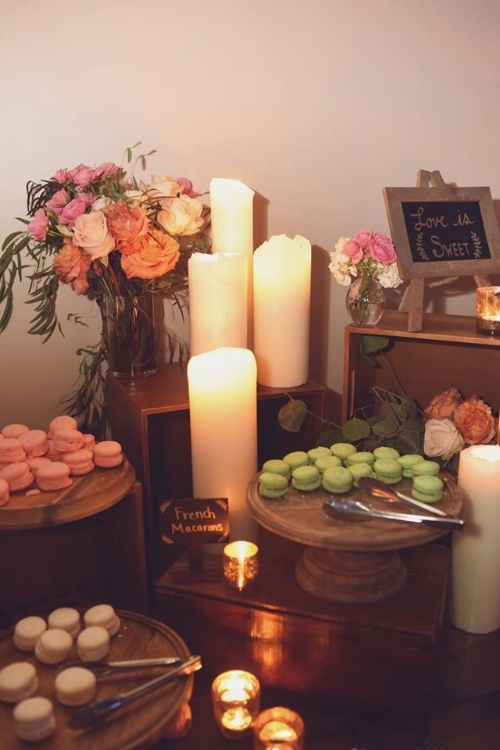 Props make a huge difference in the depth of a dessert table. Anna + Chris's wedding was in October and I loved how they incorporated pumpkins and other fall foliage while still looking romantic and classic. Anna + Chris chose this adorable cake topper with their even cuter new last name! We LOVE cake toppers, they're very nostalgic of old fashioned wedding cakes and bring personalization and added height to a tiered cake. Congrats to Anna + Chris!